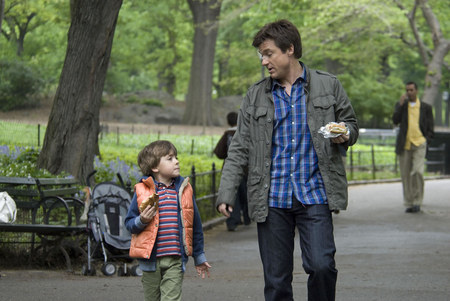 In The Switch, Jason Bateman’s character, Wally, is affable but also anxious, withdrawn, and more than a bit smug. In the scene that sets up the remainder of the film’s action, Wally gets trashed at the “I’m Getting Pregnant” party thrown by his single best friend, Cassie (Jennifer Aniston), who wants a child and has decided that being involved with the “right man” isn’t a prerequisite for becoming a mother. Wally has loved Cassie in beyond-friendly ways for years. A few weeks later, Wally learns that Cassie is pregnant. Then Cassie leaves New York to find a better place to raise her child. Then, seven years later, she gets a new job and moves back to New York with her son, Sebastian, who displays an awful lot of Wally’s core characteristics—chiefly, anxiety and pessimism—and even personal mannerisms. Then Cassie starts dating the original sperm donor, whom she still presumes to be Sebastian’s father—a strapping, optimistic (at least on the surface), outdoorsy fella named Roland (Patrick Wilson). Sebastian takes to “Uncle Wally” a lot more than he bonds with his supposed father, Roland, and Wally comes to love Sebastian profoundly. Then the truth comes out, gradually, about Sebastian’s paternity, and there’s much drama, and the romantic and family arrangements are eventually worked out. So that’s the plot of The Switch, but thank God, that’s not everything that it’s about, at least not for me. If the film had nothing to offer but this narrative, I doubt I’d be able to recommend it, because of some real flaws in characterization and execution. To name a couple, I strongly disliked the painful, pseudo-profound voiceovers about “fate” and “the human race” at the beginning and end of the film. This is a very small story, with small revelations experienced by somewhat anonymous characters, so to bookend it with sweeping statements about humanity is a serious mistake. Also, Jennifer Aniston gives a game, somewhat winning performance, but she wasn’t given very much to work with in Cassie, who seems to be a vehicle for midlife maternal anxiety and an object of the affections of broken men, and not much else. Finally, for a purported “romantic” comedy, the central Wally – Cassie romantic relationship was not conveyed convincingly at all. Bateman and Aniston had outstanding “friendship chemistry,” but we see almost no movement toward mutual romantic attraction between the two. But I do recommend The Switch overall, and one of the main reasons why can be summed up in three words: Jason freakin’ Bateman. I realize this is subjective, of course, but I was with Bateman on everything he did with the Wally character—he inhabited Wally so fully that it becomes impossible to imagine anyone else playing the character with a remotely comparable level of success. Looking at the first idea from my plot synopsis—“Wally is affable, but also anxious, withdrawn, and a bit smug”—Bateman was the perfect choice to play that character and make him authentic, likable (despite his drawbacks), and, crucial in the success of the film, funny. I rewound and watched a scene from Cassie’s party a few times and marveled at Bateman’s prowess as a comedic actor. When Roland tells Wally that he teaches a course on feminist literary theory at Columbia, Wally responds with a simple, “Is that right?” Not funny at all on paper, but I promise that, as performed, the line is devastatingly funny and wholly consistent with Wally’s smug, instant dismissal of Roland. The film's true emotional center. Importantly, Bateman is also quite good at conveying his character’s central arc, described in another clause from my plot synopsis: “Wally comes to love Sebastian profoundly.” I think this is the “love relationship” that the film truly cares about, and because of the fine job done by Bateman and Thomas Robinson, the child actor who plays Sebastian, it’s actually quite moving. Though I doubt he could articulate it fully, Sebastian seems to have come to believe that no one will ever fully understand him. The boy, while recognizing and valuing his mother’s love and devotion, also craves a more rounded family unit—he collects picture frames and the stock pictures sold in them, and creates stories about an extended family (uncles, cousins, grandparents) that exists only in his imagination. After a rocky start, Sebastian sees Wally, who seems to understand both his worries and his hopes, as a key to finding what he had been missing. And Wally finds in the boy someone for whom he is willing to shed his reflexively dismissive, withdrawn mode of engaging (or refusing to engage) everyone around him. Wally grows to love the boy unreservedly, with his whole heart. Because of how convincingly Bateman portrayed who Wally had always been, and yet still was able to make us root for Wally to become a more complete person, the opening of Wally’s heart becomes the film’s most affecting development and its greatest storytelling success. In sum, by no means is The Switch a great film, but I do think it has plenty to offer. There are some good laughs and some exceedingly sweet moments. Best of all, the performance by Jason Bateman made me appreciate him even more as both a comedic and a dramatic actor, and, perhaps more important, as one of our era’s most compelling screen presences. I liked Jason Batemans performance but the rest of the movie and especially Jennifer aniston was horrible in my opinion but great review!